As a pet owner it is devastating to find out your dog is infected with heartworms. This article sets out to help you understand heartworm test results and also to explain why some dogs still test positive after undergoing treatment. If this is a worry for you, please read on as understanding the mechanics of heart worm testing will help you understand why this may sometimes happen. With any type of laboratory testing, certain conditions may exist that will cause laboratory tests to fail. In many cases, test results can indicate a false positive or false negative result. This is true for human and animal laboratory testing. However, these false results are rare. False results typically occur due to human error in testing such as improperly following manufacturer guidelines, or the specimen is contaminated. Veterinarians follow strict protocols for testing. In fact, most veterinarians will request an X-ray if a dog tests positive as this helps confirm initial test results. Currently, the most accurate heartworm test for dogs is the antigen test. The test will detect the presence of specific antigens of the adult female worms. Most of these tests will detect the antigens of female worms that are at least seven or eight months old. If the worms are less than five or six months old, the antigen test may indicate a negative result. In addition, if the dog is infected with larvae (baby heart worms); the antigen test may be negative. However, as the worms mature, your dog may test positive in the future. If you would like to read more about antigen testing, use the link to visit an article on the American Heartworm Society web site. Many veterinarians use a pre-screening test to detect larvae in the dog’s blood. The dog’s blood is smeared on a glass slide and viewed under a microscope. Your dog may test positive for larvae but the antigen test may be negative. Larvae may be detected in the blood, however due to the life cycle of the worms, they may not be mature enough for the test to be able to detect the antigens. If your dog is positive for larvae, your veterinarian will recommend re-testing in six or seven months. At this point, the adult worms will be mature enough to be detected by the antigen test. If at this time the dog tests positive, your veterinarian will probably request an X-ray to confirm the infection. Once confirmed, your veterinarian will determine if your pet is a candidate for heart worm treatment. My Dog’s Heartworm Test is Still Positive After Treatment! Once your pet has undergone treatment, another antigen test will be performed. It is possible the test will be positive. However, this does not mean the treatment was unsuccessful. The current Immiticide treatment for heartworms has a high success rate. 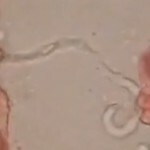 The problem with the antigen test is it does not determine whether live adult worms are still present. It can only detect the antigens and these may be present in the blood stream for 9 to 12 months after treatment. If the heartworm test is positive after treatment, it is unlikely your veterinarian will recommend that your dog undergo treatment again. The typical recommendation will be to keep your dog on preventative heart worm medicine. This will keep your dog free of larvae and reduce the potential of developing adult worms. If you keep your dog on preventative medicine, it is likely the next antigen test will be negative. There are several documented cases of dogs that continued to test positive for the heart worm antigens three to four years after treatment. The dogs did not have adult worms; however, the antigens continued to be present. These cases are uncommon, but they do occur. It is important to distinguish the difference between a heart worm and its antigens. Just because antigens are present after treatment, it does NOT mean the treatment was unsuccessful. Depending on the severity of the infection, treatment will eliminate 90 to 98 percent of the adult worms. If your dog has two or three worms, the treatment will likely be 100 percent successful. A dog can have two worms or it can have a hundred worms. This depends on how long the dog has been without preventative medicine. It also depends on how long the dog has been without the benefit of a veterinarian examination. Most veterinarians perform testing annually during the dog’s annual check-up. 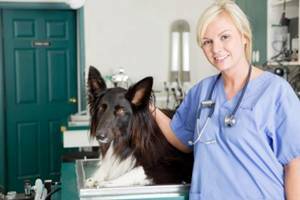 If your pet visits the veterinarian annually, it is unlikely your pet will have a severe infection. In most cases, dogs will have a few worms instead of hundreds. If you have had your dog treated for heartworms and the antigen heartworm test results are still positive, discuss treatment options with your veterinarian. Your veterinarian will probably recommend annual testing after the initial treatment. If you follow your veterinarian’s instructions and keep your dog on heartworm preventatives, it is likely your dog will test negative within the year after treatment. While a positive test after treatment can initially be very worrying, I hope this article has explained why this does not necessarily mean your dog still has heartworms. Follow your Vet’s advice and be diligent with your dog’s preventative medicine and your beloved pet should have a long and happy life. I adopted my dog, Sadie, from a shelter 2 years ago. She was estimated to be 1 year old at the time. She is a mix of Chihuahua and Terrier. She weighs approx. 11 pounds and is 12 inches tall. She tested positive for heartworms but I elected to adopt her anyway. I had her treated with Immiticide. She was then put on Heartguard and am giving it to her monthly per my Vets instructions. After 2 years she is still testing positive for heartworms (adults) but has been negative for the babies for over a year. The vet has said that she has not seen this problem before. That is that the dog still tests positive for adult heartworms after two years. The vet has discussed two choices: 1) Second round of treatment of Immiticide, or 2) Continue giving the Heartguard monthly and hope that the adult worms present will die. The vet was not clear on what was the better alternative. I ask, “Wwhat would you do if it were your dog and the response was I guess I would treat it with the Immiticide,” but she wasn’t overly convincing. Overall, Sadie is in good health. She is not experiencing any symptoms consist with advanced heartworm disease. I am not certain I want to subject Sadie to this procedure unless is the better alternative. I have read your web pages on this topic and appreciate your thoroughness. I would be interested in your opinion in this matter. Thank you in advance for your consideration of this matter. Sorry for the late reply to your question. You do not say how old Sadie is but I think age should be taken into consideration in deciding the right course of action – it is a very difficult decision and personally, I would get a second opinion from another Vet who can examine Sadie. I have never heard of this problem either – sorry not to be more help. Thank you for this wonderful resource which I just discovered. I am in the Northeast, and my rescue dog (Lab /Pointer mix) from Louisiana tested positive for heartworm 1 year after we adopted her. We had given her heartworm treatment religiously (Heartguard at first, and then the vet switched her to Trifexis and Sentinel). She had tested negative on arrival but the vet said that the worms just might not have been big enough until 6 months later to show up. We went through the three injection course: 1 at first, 2 back to back 4 weeks later. We put her on Heartguard alone (stopped the Sentinel). At 4 weeks after the last injection, they did a blood draw, sent it to a lab, and she came back still positive for the microfilariae (1-2 per low grade field). The vet said the course of action should be to wait 5 months, let the Heartguard do its work, and test again for the antigens. I am a little suspicious of my vet’s assessment. The tech who delivered the results said that the vet’s would have to research answers to my questions because they didn’t have many heartworm patients. My question is this: have you ever heard of a dog being positive still after treatment? Is it really possible that the adults are dead even though mirofilariae are still circulating? I am worried that I am losing precious time trying to beat this infection by waiting. Would you get a second opinion if you were me? Hi Alison, I just wanted to say thank you so much for replying to my message. I just found the thread I started with your response! My dog is getting a blood draw to test levels of microfilariae tomorrow. It is a quantifiable test so my hope is that we may be able to compare results from a few months ago and gauge whether there are still heartworms reproducing, even if the antigen test will still be positive. Of course, we will still need the antigen test a couple of months down the line, but I just want to have some sense of what is going on. I will keep you posted! Again, I really appreciate your website!